Witches really are a detestable breed. They disguise themselves as lovely ladies, when secretly they want to squish and squelch all the wretched children they despise. Luckily one boy and his grandmother know how to recognize these vile creatures, but can they get rid of them for... read full description below. A true genius...Roald Dahl is my hero - David Walliams Phizz-whizzing new branding for the world's No.1 storyteller, Roald Dahl! Exciting, bold and instantly recognisable with Quentin Blake's inimitable artwork. Witches really are a detestable breed. They disguise themselves as lovely ladies, when secretly they want to squish and squelch all the wretched children they despise. Luckily one boy and his grandmother know how to recognize these vile creatures, but can they get rid of them for good? 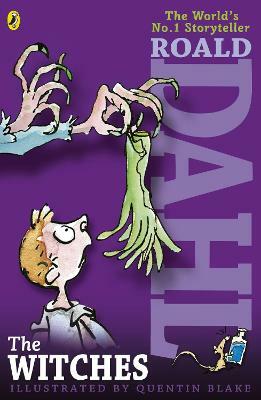 Roald Dahl, the best-loved of children's writers, was born in Wales of Norwegian parents. After school in England he went to work for Shell in Africa. He began writing after a monumental bash on the head , sustained as an RAF pilot in World War II. Roald Dahl died in 1990. Quentin Blake is one of the best-known and best-loved children's illustrators and it's impossible now to think of Roald Dahl's writings without imagining Quentin Blake's illustrations.